Always smiling, always grooving, Floyd is the beating heart of UK party band Pure Genius. Singing from an early age and attending various young talent shows, Floyd eventually ended up with the singing career he deserved. 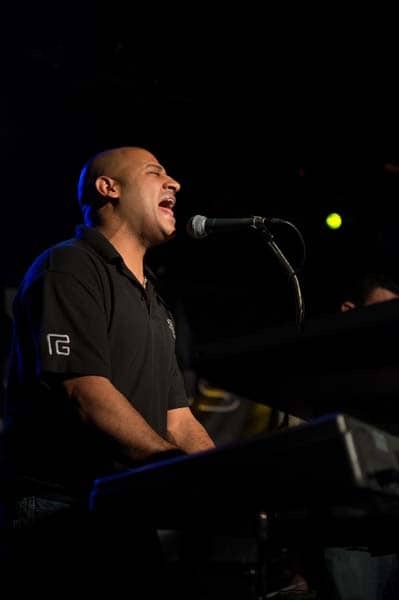 Taking his vocal influences from Stevie Wonder, Otis Redding, Robert Cray and many others, he has become one of the most sought after vocalist around. His various Northants function bands have taken his career to singing at festivals and Butlins. You will be drawn by that infectious smile beaming from behind his keyboard! Steve draws his musical influences from a lot of different genres, including country and rock. He is a huge fan of Bruce Springsteen and his passionate vocal style reflects this. Being in several bands and as a soloist guitarist in recent years, Steve made a name for himself with his strong powerful vocals. After several successful auditions on the BBC’s “The Voice” in 2012 he quickly began to be one of the most sought after vocalists in Buckinghamshire. Now being part of the best UK party band he is starting to make a name for himself further afield. 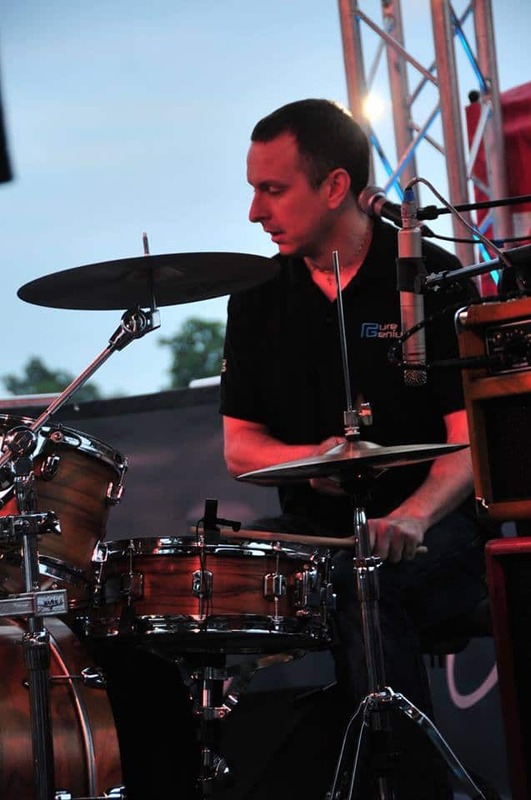 Greg began playing drums aged 14 and at age 16 he formed the jazz/rock band Moom co-writing original tunes, winning a recording contract and subsequently recorded two albums with Delerium Records. He then later joined Grateful Dead tribute band, the Cosmic Charlies that toured Europe, played live on BBC Radio London and graced the Glastonbury festival twice, as well as touring as the backing band to the late Merl Saunders. Amongst the venues he’s played are the Chalk Farm Roundhouse and Astoria Theatre in London and the Melkweg, Amsterdam. He also records with Northampton band the Reeds, writing and co-writing many of the songs on the album, as well as keeping the legacy of the Grateful Dead alive with the Grateful Dudes. As a founder member, he now sits behind the skins of your favourite UK party band Pure Genius! 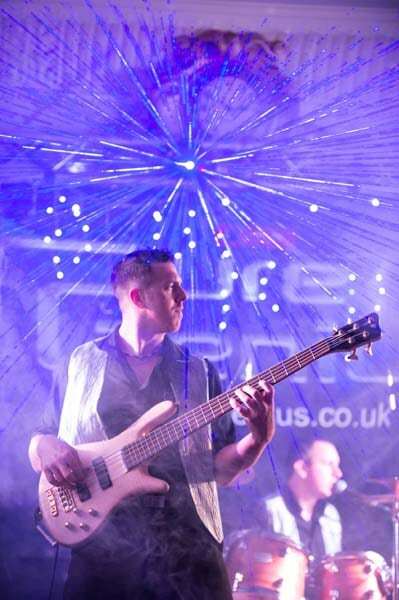 Pure Genius’ funky bass man Rob drew his early influences from the likes of Jamiroquai’s Stuart Zender. His tight disco / funk style lends itself perfectly to playing exciting party music in function bands. He has a track record of delivering great live performances with successful party bands the Catch, Hitsville and Boogie Wonderband. Rob continues to burn up dancefloors all over the region with his irresistible bass grooves! Pure Genius sax man Steve started playing the saxophone at and early age. He made his way through the grades system and also climbed the ladder within the Northamptonshire county bands. Steve played in numerous Northants county bands including the County Concert band and County Big Band which lead to playing many venues up and down the country including the Queen Elizabeth Hall and Albert Hall. He won best improvisation award in 2000 and continued developing his skills as an improviser. 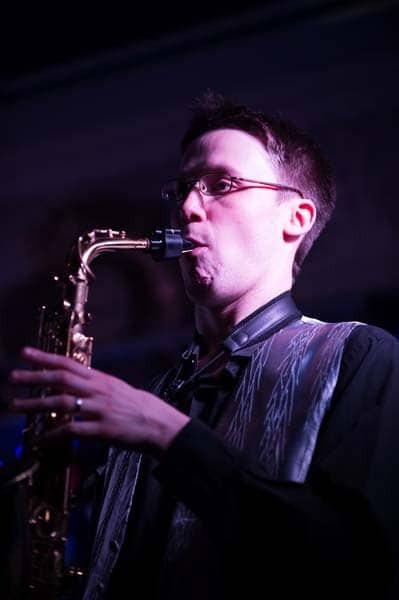 Steve graduated in Jazz at Leeds College of Music and now teaches and composes as well as taking ripping solos with the finest UK party band! Marty began playing the guitar at the age of 12, teaching himself the music of The Shadows and The Beatles. He then quickly began his apprenticeship performing at social clubs across Northamptonshire. In 2003 Marty relocated to London to study at The Guitar Institute under some of the UK’s best guitar teachers. In 2004 he scooped their prize for ‘Top Guitar Performer’. The following year, Marty competed in the national guitar competition ‘Riffathon 2005’ performing Led Zeppelin classic ‘Rock And Roll’ at the Hammersmith Palais in front of judges Jimmy Page (Led Zeppelin), Brian May (Queen) and Dan Hawkins (The Darkness) who unanimously voted Marty 1st place winner with Jimmy Page announcing “without a doubt, this guy came in and he actually played it better than I could’ve done”. Marty now divides his time between teaching guitar, recording sessions and being a full-time member of Pure Genius.